Will Sunny and M.K. return to the Badlands? Has the Into the Badlands TV show been cancelled or renewed for a third season on AMC? 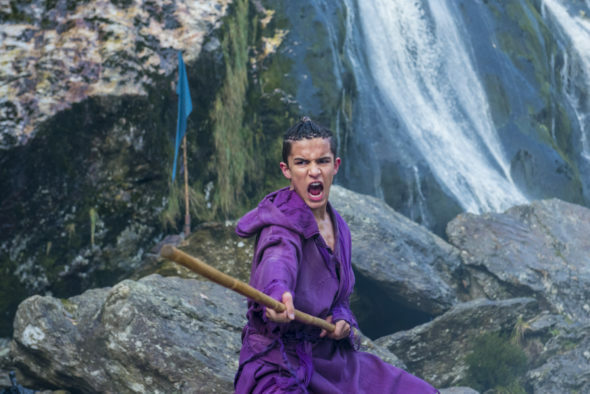 The television vulture is watching all the latest cancellation and renewal news, so this page is the place to track the status of Into the Badlands season three. Bookmark it, or subscribe for the latest updates. Remember, the television vulture is watching your shows. Are you? A martial arts drama airing on the AMC cable channel, Into the Badlands stars Daniel Wu, Marton Csokas, Orla Brady, Sarah Bolger, Aramis Knight, Emily Beecham, Oliver Stark, Madeleine Mantock, Ally Ioannides, and Nick Frost. The AMC series takes place centuries into the future, in a feudal society called the Badlands. Season two finds Sunny (Wu) and M.K. (Knight) separated and imprisoned in unlikely places. While M.K. struggles to control his powers, Sunny resolves to fight his way back into the Badlands and find his family, or die trying. Meanwhile, The Widow (Beecham) continues to consolidate power against the other Barons, while a dark threat prepares to exact revenge on them all. The second season of Into the Badlands averaged a 0.79 rating in the 18-49 demographic and 1.99 million viewers. Compared to season one, that’s down by 56% and 48%, respectively. Learn how Into the Badlands stacks up against the other AMC TV shows. On April 25, 2017, Into the Badlands was renewed for a third season which will debut on April 22, 2018. Stay tuned for further updates. In its first season, the Into the Badlands TV show was a top three performer for AMC. Season one averaged a 1.79 rating in the important 18-49 demo and 3.86 million total viewers. Although the season two premiere numbers fell short, the numbers weren’t that bad. Now that it no longer has The Walking Dead as a lead-in, the ratings have plummetted. I suspect Into the Badlands will be renewed for a third season but AMC could easily cancel it. I’ll keep an eye on the ratings and update this page, periodically. Subscribe to be notified of any cancellation or renewal news. 4/25 update: AMC has renewed Into the Badlands for a third season. Details here. Find more Into the Badlands TV series news or other AMC TV show news. What do you think? Are you glad that the Into the Badlands TV show has been renewed a third season? How long do you think this TV series will last? Will the season 4 of “into the Badlands” be out?? ?